The speed of this film capture is unknown. Inge De Bruijn's time for this 50-m race was 24.47. 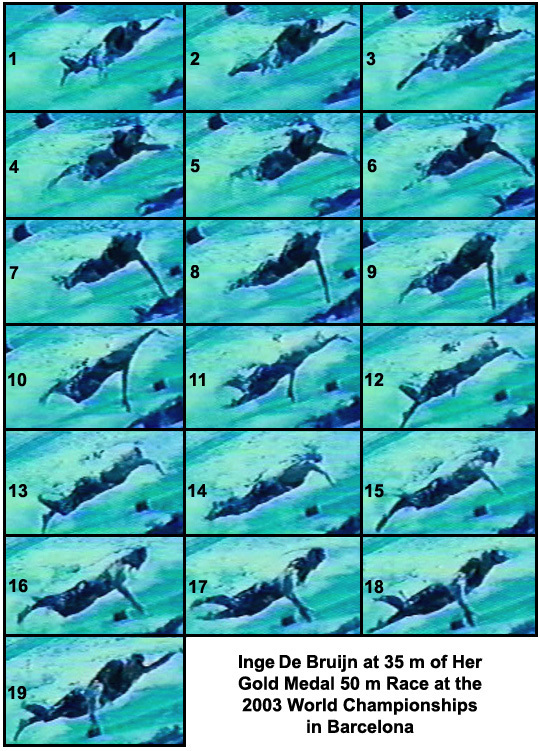 Frames #1-3: The swimmer's left arm enters the water fully stretched forward. The wrist bends immediately illustrating that the swimmer spends no time with the arm in an unproductive stroke phase. The right arm continues to push backward with its elbow extension still providing considerable propulsion (as can be seen by the substantial drag pocket on the back of the forearm in Frames #1 and #2). The swimmer's streamline is good with the head down in the water causing a counterbalancing elevated hip position. Frames #4-6: The left elbow flexes and the upper arm rotates medially. This positions the lower arm and hand for horizontal propulsion. In this series of three frames, the relatively long left arm is fixed and the body is levered past it. The camera angle makes the left arm look longer than the right arm in its pull. The pulling and recovering arms are almost opposite each other, which sets up the stroke for an application of continuous propulsive forces. Frames #7-9: The left arm pull looks like it is "long and deep". That is partly and illusion because of the camera angle but is also a characteristic of sprinters. Sprint freestylers tend to sweep the extremity of the arm in a long arc, rather than a shorter, more direct stroke that characterizes distance swimmers. One reason for the difference is the longer arm generates greater velocity and force application, which is critical for sprinting. However, it is very inefficient in energy utilization. Since energy conservation is not a major but a small part of sprinting, sprinters tend to develop a bigger arm sweep than distance freestylers. Although the swimmer's arm looks straight in these frames, it is bent at the elbow. Frames #10-12: The right arm enters and the wrist flexes immediately. As the left arm completes its extension, the right arm repositions very quickly into a propelling position. Frames #13-15: The pulling right arm achieves the classic "elbow-up" position and then is propelled backward by abduction and then adduction of the upper arm. As was illustrated with Alexandre Popov, in this phase of the pull, Inge De Bruijn uses the whole arm as a propulsive surface. Frame #15 illustrates a drag pocket off the top of the right arm. Frames #16-18: The whole right arm is still propelling in Frames #16 and #17 (the upper arm drag pocket is still visible). In Frame #18 adduction ceases and elbow extension begins. Frame #19: The position of Frame #1 occurs again and the stroke cycle commences. Inge De Bruijn displays features of classic sprint technique. The swimmer produces constant propulsive forces, the body streamline is excellent, and whole arm propulsion is achieved in the most critical phase of the arm movements.